Using the Hubble Space Telescope, astronomers have photographed the central region of NGC 247 — a spiral galaxy located approximately 11 million light-years from Earth in the direction of the southern constellation of Cetus. 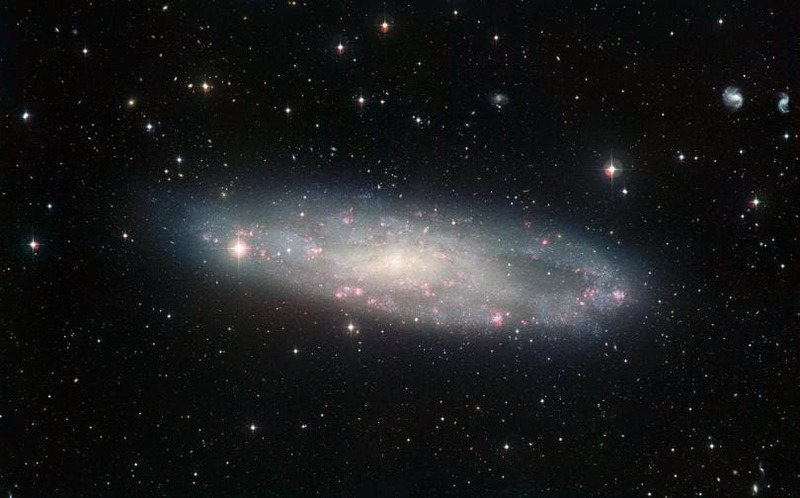 NGC 247 is one of the main galaxies that form the Sculptor Group — a group of galaxies associated with the Sculptor galaxy NGC 253. In the Hubble image, NGC 247’s nucleus can be seen as a bright patch surrounded by a mixture of stars, gas and dust. The dust forms dark patches, while the gas, mostly scattered throughout the galaxy’s arms and fringes, is visible as bright knots called H II regions — so called because of they are rich in ionized hydrogen atoms. The ESO video below starts with a view of a rather empty part of the southern sky, far from the Milky Way. As we zoom in we can see the spiral galaxy NGC 247, lying about 11 million light-years from us in the constellation of Cetus (The Whale). 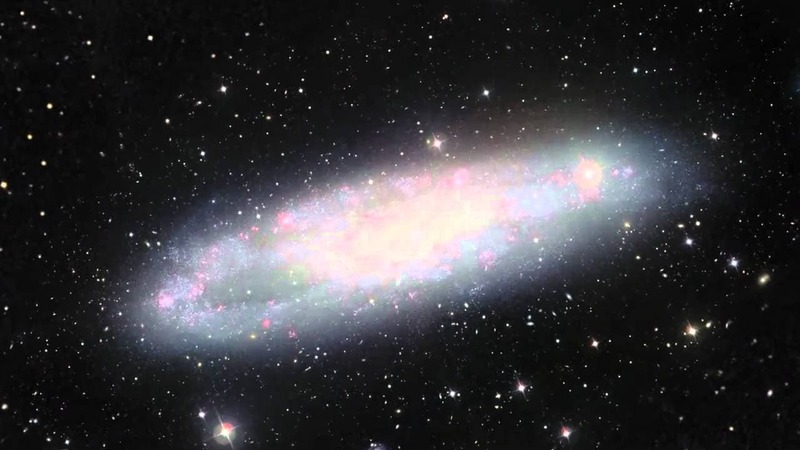 We also catch a glimpse of the bright Sculptor galaxy NGC 253, which lies close to NGC 247. The final detailed view shows a new image of NGC 247 from the MPG/ESO 2.2-metre telescope at ESO's La Silla Observatory in Chile. “This galaxy displays one particularly unusual and mysterious feature. … The northern part of NGC 247’s disc hosts an apparent void, a gap in the usual swarm of stars and H II regions that spans almost a third of the galaxy’s total length,” the European Space Agency said in a statement accompanying the picture. Although this void, located on one side of the galaxy’s spiral disk, is not visible in the Hubble photograph, it can be clearly seen in an earlier image captured using the European Southern Observatory’s MPG/ESO 2.2-meter telescope at the La Silla Observatory in Chile. The stars present in this void are “significantly” older than the ones outside it. This indicates that that the birth of stars in this region has, for some reason, slowed down, and has not taken place for a billion years or so. “Although astronomers are still unsure how the void formed, recent studies suggest it might have been caused by gravitational interactions with part of another galaxy,” the ESA said.